Misha Bearach Teddy Bear - 11"
Misha makes people smile and heal quickly. 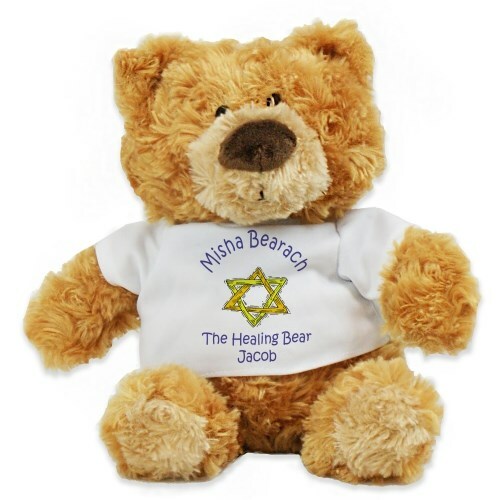 Send a prayer of healing to a special someone with our unique Misha Bearach Teddy Bear. This thoughtful gift of healing is presented on our soft and cuddly Teddy Bear. The Star of David is displayed on a t-shirt worn by the exclusive Flynn teddy bear, from Gund. Flynn features a luxury touch with distinctive rose-swirl pattern plush fur. Flynn measures 11". Surface-washable construction & Appropriate for ages one and up. Free Gift Wrapping and a Free Gift Card is included to create a thoughtful presentation.